Hundreds of Arriva bus drivers are to take part in a week-long strike in a dispute over pay. About 650 staff in Teesside, County Durham and parts of North Yorkshire will walk out from 6 January in a call for a wage rise of £1 per hour. The Unite union said drivers were the second-lowest paid in the country, but Arriva said it had made "considerable concessions" in the pay talks. A revised offer, after a strike in December was postponed, was rejected. Unite regional officer Bob Bolam said: "Our members are saying to us 'we want action, we want this resolved' and this is the way that it's got to be resolved unfortunately. "We apologise to the travelling public." Arriva managing director for the region, Nigel Featham, said: "Unite claims, without any attempt at justification, that our drivers are poorly paid relative to others. "Quite simply, it's a false flag, and one that has led to an unnecessary industrial action. They're striking for something they have already been offered." 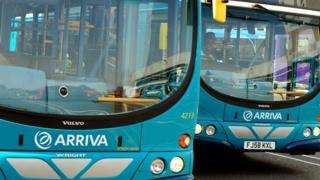 Arriva said an emergency timetable would be operating between 6 and 12 January.